After a brief glorious couple of days over the holidays of “knitting whatever the hell I want, please and thank you very much,” then a bit more after rounding up a few deadline projects, I’ve been able to go back to the beautiful Gwendolyn sweater I’ve had going on since, well, for far too long. I love the colour, the pattern is gorgeous, Fiona Ellis is a skilled and trustworthy designer, and let’s face it, I would love a new knitted cardi in my closet. This is all of the good. I went with door number two. This is, of course, flying in direct defiance of the extremely rational and gauge-swatch-based decision I made a few months ago back when I started this sweater (dear God this is taking me forever, I need to step on it), at which point I reasoned that since my stockinette gauge was looser than the pattern, that I could knit a smaller size that I needed to, and get the size that I wanted. 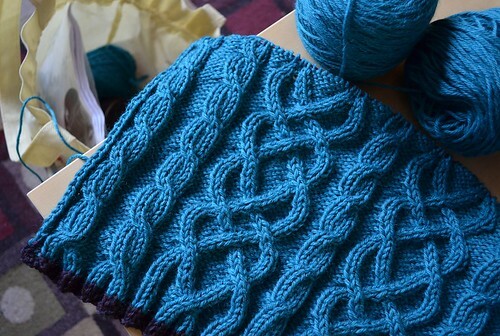 And it’s a well-reasoned argument to be sure, but neglects the fact that I swatched in stockinette and the entire back piece is completely composed of cables, not stockinette. My gut made the final call. Swatch vs. gut – who will win? Well truthfully, I’m not sure, but I’ve had to keep so much of my brain free for so many other knitting decisions lately, that I’m willing to give it a break on this one and err on the side of possibly too big, than possibly too small. TAKE THAT, KNITTING. I am the boss of you, and I shall take the consequences. Looks great, and I think its a real achievement to not take the easy option and carry on regardless! undoing all that work is hard, but will definately pay off in the end, I’m sure! and what a gorgeous colour wool! I just frogged 800 yards because I can’t count. My swirl that was supposed to have eight segments only had seven. MY GOD! What a brave decision! Hours of knitting..up in smoke. It looks great. I’m with you on the chocolate. I bet you did the right thing. Looking at the pictures with the pattern, there’s some negative ease there that you might not want. Plus, it looks gorgeous, and wool can always be made smaller! I’ve had the same issue with my Halcyon for… um, not going to admit how long. I now know what I’m going to have to do – yup, time to stock up on chocolate! I have had a few of those eye twitches myself. That’s the up side of loving to knit. Even if it means more knitting, it isn’t like water torture. I hate that period of indecision, though. Should it undo it all or carry on. Twitch is just the right word for it. I hate that part!! My guess is that your gut is right. Go forth and knit. Great decision! Niggling doubts would have ruined your knitting pleasure. All the best to get speedily back to where you were at! I hate that you had to frog it but it’s probably for the best. I’m sure you be glad you did it. Did you swatch the cables? I got too big on stockinette and too small on cables. Had to go UP a needle size after a slightly too big stockinette swatch. Having just finished the back that should be “too big” it looks right or even slightly small. I’m pretty sure you made the right call. 😉 Swatch vs. gut, that made me laugh. I’m all for gut too! I think you made a good decision! When I started reading, I thought you were leading up to saying you’d found a miscrossed cable and couldn’t decide whether to fix it or not. So I was studying your photo carefully and thought I spotted one in the bottom left corner of the back of the sweater. However you have already frogged, so problem solved! “You can block the snot out of it” ~ Love it. The gut is a hard one to ignore, and it doesn’t feel good when it constantly nags me. You are very brave. It looks gorgeous. agh, the pain of ripping out hours of work- I know it well! However, your brave and honest post helps those of us out here who need to know that other people experience the pain too, and it’s a part of knitting, and all that. Sigh. Even though it is hard, it was the right decision, what if you spent all that time and then it was too small…..
OMG–I am having heart palpitations—those beautiful cables–need wine to go with the chocolate! Whenever is chocolate not necessary? I just love the color of yarn you picked out! I hate when it comes to that decision of rip it out or not. Especially with something as pretty as those cables! Swatching never works for me. I usually just make the next size larger. But then I like big things, lol. ooh, tough call! Did you wet block your swatch? I trust my swatch over gut if I wet blocked my swatch, since otherwise I feel that way every time I knit a sweater… thinking it must be too small. Dude, I am committed to the ripping out at this point! I’m not bothering about any shaping or illusions of shaping, though, it’ll be the cardi version which will be a bit more versatile anyway, and I’m cool with that. That’s why I always start with the sleeves of a sweater. It gives me a chance to check gauge again on real knitting and it’s not as much knitting time wasted if I have to start over. Thank you for your decision. I have been working on a vest for my husband and just dragging my heels with it. Deep down I know it was coming out too small. After reading about your decision I ripped mine out and feel great about starting over. i understand ‘rippin’ ‘froggin’ !! i just decided to frog a JaredFlood Hemlock Ring throw that i know has some mistakes in it…instead of a doily size i thought i’d go for big…kept making mistakes and it ruched(rippled) when i got done. since i used a stash acrylic i knew it wouldn’t block out. i may rip it down to a tabletop doily size that i can see lays flat!! 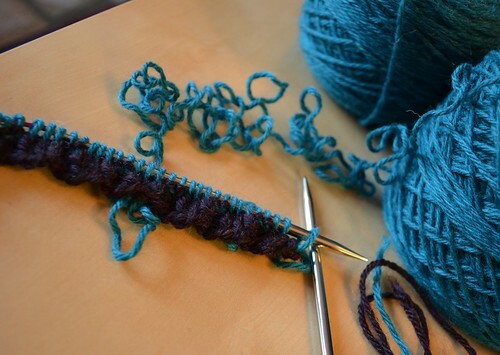 we, knitters, all know the perfectionist in us!!! What yarn are you using for this cardigan? It’s a gorgeous color! Ouch. I might have cried a little when I saw that you undid it all. But, I’m sure it will look amazing this time, and in the right size. I wouldn’t have been that brave, I’m pretty sure. Good luck! I feel crazy when I do something like this. But it happens all the time, nonetheless. I’m sure you made the right call. I completely finished my pullover and seamed it all together when it looked way too big, and it just was. Blocking helped a little but then it just stretched out again. So I frogged it and I’m reknitting from scratch. I think it’s actually a bit exciting… and it’s certainly looking better this time.